“The Colossal Magic Nothing” draws to a close in Rat Queens #10. By its conclusion, however, it’s made clear that the story’s ramifications will play heavily in the overarching narrative moving forward. Writer Kurtis J. Wiebe and artist Owen Gieni succeed in bridging the gap between the first and second volumes of Rat Queens, respecting the plot and character development which came before, while establishing a new path forward for the Rat Queens. 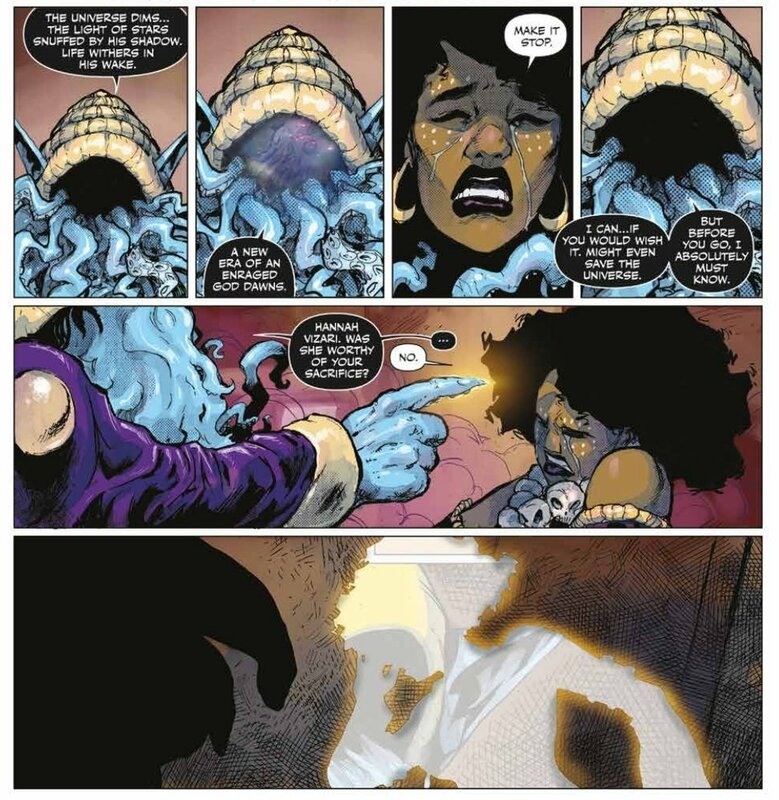 At the issue’s onset, Dee is confronted by the mysterious wizard who has haunted the Rat Queens throughout the “The Colossal Magic Nothing” storyline. Still reeling from the revelation that she had traveled time to save Hannah from imprisonment in Vaale, Dee is overwhelmed when the wizard reveals themself to be an emissary and manifestation of the dark, tentacled god, N’Rygoth, the deity from whom she was previously bequeathed the power to travel time, and to whom her people, the Jaran, pray. Shifting its appearance to more closely resemble N’Rygoth, the wizard tells Dee that, because of her actions, N’Rygoth will now torture the Jaran across the multiverse and end all of existence in its rage. The wizard then asks Dee if saving Hannah was worth it. When Dee somberly responds no, the wizard removes her from reality, as had similarly been done to both Hannah and Violet. Entering just in time to witness Dee vanish from reality, Betty confronts the wizard, demands her friends be returned, and asks why the wizard is acting in such a malicious manner. In reply, the wizard says the world “...is mired in sadness, pain and suffering,” and explains their intention to eradicate suffering. In response, Betty posits that “Suffering is what makes every other part of life beautiful.” The two converse and take turns telling tales of woe from their pasts to illustrate their opposing philosophical arguments, with each story being told through a unique artistic style more simplistic than Gieni’s traditional work, with cartoonish looks reminiscent of He-Man and old school anime meant to evoke a departure from reality. Betty recounts the backstory of her former group, The Five Monkeys, while the wizard tells a tale of being betrayed by someone they considered family, abandoned to suffer eternity in a cold, empty void. At the conclusion of the wizard’s story, Betty deduces the wizard’s true identity, and unmasks the mysterious villain to be none other than Hannah Vizari; specifically, the Hannah who was left to rot in Vaale at the end of Rat Queens: Volume 1, and the same Hannah who eventually went mad, turned evil, and tried to kill her former compatriots 20 years later. Thought to have been erased from existence, “saved” as a result of Dee’s time travel machinations, the dark wizard Vizari reveals to Betty that since Vaale is a void prison, which exists outside of space and time, her imprisonment there could never be negated. Despite the Rat Queens’ change of heart and attempts to set things right, 20 years after the fact, they still abandoned Hannah following their adventures in Mage U. Evil Hannah explains to Betty that she had saved the reality eradication of her Smidgen sister for last, because Hannah wanted to make her suffer; have her feel like she was slowly losing her mind as the people she loved steadily disappeared from existence. Hannah wanted Betty to feel as alone and insane as she did all the years she was locked away in Vaale. In the span of one issue, Kurtis J. Wiebe masterfully manipulates emotions, timelines, and red herrings to tie up a multitude of loose ends, while simultaneously introducing a plethora of new plot points to progress the narrative in meaningful ways. Misleading both Dee and the audience from the get-go, the wizard’s false revelation as an operative of N’Rygoth now begs the questions of what ramifications will actually result from Dee utilizing N’Rygoth’s powers, and if Dee will remember her past actions, traveling time. The existence of multiple timelines also brings up questions regarding the futures the Rat Queens left behind. How do their significant others in the other timeline compare to their currents loves, and what then happens to any children they had in the other reality? However, the biggest question moving forward is, how does this colossal revelation affect the Rat Queens’ dynamic; how will their friendship change as a result of their previously obscured actions and inactions? Instituting a monumental paradigm shift, Rat Queens #10 irrevocably changes not only the interpersonal relationships among the Rat Queens, but also the very fabric of their reality. Equally significant is this issue’s introduction of a nefarious looming nemesis for the Rat Queens, who, like all great foils, acts as an intimate dark reflection to the heroines and their journey. Unforgettable, this issue showcases Kurtis J. Wiebe’s writing at its finest, culminating two Volumes of Rat Queens character development and plot into an emotionally devastating climax, that opens up worlds of subsequent narrative possibilities.